This chapter was updated in March 2015 to reflect the Early Help Assessment and make links to the Lincolnshire website. A new diagram of the Model of Children’s Needs has been added. This document brings together information which will help you to work with other agencies to meet the needs of all children in Lincolnshire. It will help you in identifying when a child may have additional need(s). A structure for delivering integrated support to children which safeguards and promotes their welfare. Lincolnshire's Model of Children's Needs is based on the Framework for the Assessment of Children in Need and their Families and is consistent with LSCB Procedures. The model provides a framework to develop a common understanding amongst professionals of children's needs / vulnerabilities, shared assessment procedures and a platform for integrated working. This is demonstrated in the following diagram. Click here to view the Model of Children's Needs Diagram. Full, accurate and comprehensive information must be collated as part of any assessment. A chronology of historical information is a tool to understanding social history and family functioning. Assessment requires you to gather information and form judgements about a child's needs and the ability of the family to meet those needs within any given set of circumstances. At times, this will also require you to consider the likely level of risk to a child where there are concerns about the circumstances the child is living within. It will also enable you to identify when the child is at risk of poor outcomes. The diagram below illustrates the process of assessment. The first part of any assessment is to gather information. 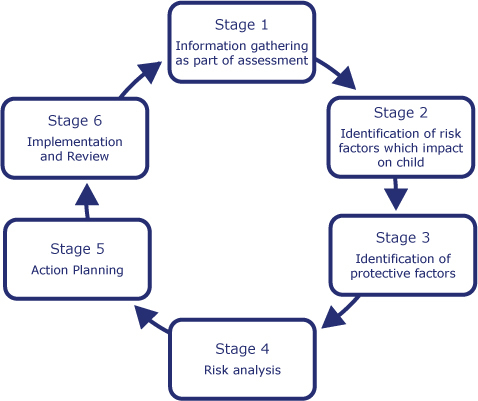 Using the assessment framework domains you will need to consider where additional support or intervention is needed if the child is to be kept safe, experience healthy outcomes and to ensure that their developmental needs are adequately met. The Early Help Assessment Form should be used for information gathering. This can be found on the Lincolnshire Children website. Risk / Vulnerability Factors are defined as those in the child's world which are likely to increase the likelihood of harm occurring. Compounding factors emanating from environment. Good social skills and intelligence. Whereas vulnerability is increased by the presence of risk factors, the presence of protective factors provides the potential for increased resilience. Once protective and risk factors have been analysed, the process requires an assessment of the likely outcomes of these factors on the child. The Early Help Assessment Form (EHA) provides a structure for this analysis. Finally, the analysis must consider what needs to change if the level of risk is to be reduced? This brings you into action planning. Children and families may experience a range of needs at different times in their lives. All children including children with additional needs require access to high quality universal services. Some children are at risk of poor outcomes. These are children with additional needs and they will require targeted support from education, health, youth inclusion support programmes and other services. A smaller proportion of children have more significant or complex needs who may benefit from assessment and or intervention by statutory / specialist services. You must remember that the principle is to work with families at the lowest level of intervention to safeguard the child and promote their welfare and that responses can escalate or reduce based on intervention and changing circumstances. The child's plan must be subject to regular interagency review in partnership with the child (if old enough) and the family. The plan must outline what needs to change for the child to achieve their potential and what the agencies and the family will do to help the child achieve this. As a child's needs are met, practitioners should vary their responses accordingly. For examples once the child's needs are met through a child protection plan, a conference will normally decide to discontinue the plan and offer support through a Team Around the Child (TAC) plan. Interagency care planning through TAC meeting. These are children / young people who make good overall progress in all areas of development. Broadly, these children receive appropriate universal services, such as health and education leisure facilities, housing or voluntary services. You may identify a child with an additional need and should use an Early Help Assessment (EHA) to gather information and assess the level of response required. You may decide that your own agency can meet the child's needs, or a referral to a specialist agency is required. In most these cases a TAC meeting would not be needed. If you identify a child with a number of additional needs/vulnerabilities and the Early Help assessment demonstrates that a number of agencies may be needed to support the child/family, you will need to convene a TAC Meeting. The EHA needs to be submitted to the TAC administrator. This smaller group of children / young people require intensive help and support to meet their needs. This group includes those children who require an assessment to determine whether or not they are children in need, those that have been assessed as children in need and those who may be at risk suffering significant harm. You should undertake an assessment using the Safeguarding Referral Form, balancing risk with protective factors to evidence and confirm whether the child has complex needs which would benefit from a social work assessment by Children's Social Care. The majority of children with complex needs will have already been receiving support through the TAC process. Note: It Is important that referrals to Children's Services are NOT labelled as child protection unless there is good reason. The likely affect the services will have on the child's standard of health and development. Local Authorities have a duty to safeguard and promote the welfare of children in need. Children who are being sexually exploited. Some children are in need because they are suffering, or likely to suffer, Significant Harm. The Children Act 1989 introduced the concept of significant harm as the threshold that justifies compulsory intervention in family life in the best interest of children, and gives Local Authorities a duty to make enquiries to decide whether they should take action to safeguard or promote the welfare of a child who is suffering, or likely to suffer, significant harm. The harm or likelihood of harm, is attributable to a lack of adequate care or control (s31). Unaccompanied asylum seeking children (See also Children from Abroad). This table includes those children where there is a need for immediate safeguarding as they may have suffered or be at risk of suffering significant harm. These children would require an immediate referral to Children's Social Care a social work assessment to be completed to better understand their needs. Children whose parents are unable to provide care whether for physical, intellectual, emotional or social reasons. The child's "experience" should be considered, families where there is "low warmth/high criticism", are particularly vulnerable. Children's Social Care is the lead agency for undertaking Section 17 and Section 47 Enquiries. If you are in any doubt or would like to discuss particular concerns contact your line manager or the Customer Service Centre. Always record the reasons for your decision. Lincolnshire's Information Sharing Toolkit is available on the Lincolnshire Children website. The EHA provides a standardised assessment that is designed to get a complete picture of a child's additional needs at an early stage. It can be used for children and young people of any age, including unborn babies. The EHA enables information to be gathered in a structured way through discussions with the child and their parent(s). It looks at all unmet needs in relation to Child Development, Parenting Capacity and Environmental Factors, not just those in which individual services specialise. It is an approach that is helping children get access to the right services earlier. Detailed guidance can be obtained via the Lincolnshire Children website. When a child needs a package of support, experience shows they and their family benefit from having one person who can help them through the system and ensure they get the right services at the right time. Where a child has additional or complex needs, the Lead Professional acts as a co-ordinator. They help create a partnership, not just with their colleagues, but with the child and young person and their family too. This role has a set of functions essential to delivering integrated support. Reduce overlap and inconsistency - to ensure a better service experience and outcome. Lincolnshire children services have moved away from an assessment model with two stages. These were called Initial and Core assessments. These activities are now combined into a Single Assessment process which is known as a social work assessment. See Social Care Assessment. This summary guide provides an overview of the continuum of needs of all children in Lincolnshire. It provides guidance on the key concepts and processes in working with children, young people and their families according to their needs. It is acknowledged that decisions about how and who is best to meet a child's needs are based on individual judgements and involves professional and personal values. Professionals are encouraged to discuss concerns openly with their own agency line manager or with Children's Social Care. (If in doubt consult). The Early Help Advisors based in Customer Service Centre will be able to offer advice on meeting the needs of children.